Every semester, we strive to organize events (public lectures, movie screenings, workshops, etc. ), which will benefit Purdue students and staff (linguist and non-linguists, alike). "Every five months, another Native American Language is lost forever. Today, only 2% of Native Americans are fluent in their language, nearly all elders. Most languages have only a handful of speakers left. It is a crisis. And yet there is hope. Since 2005, The Language Conservancy has worked with more than a dozen tribes to help save their languages. 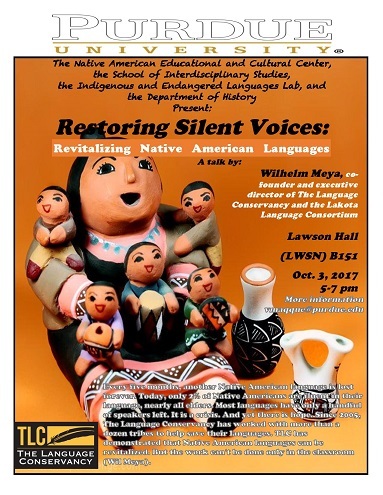 TLC has demonstrated that Native American languages can be revitalized. But the work can't be done only in the classroom." Our major event in the Spring 2017 semester was a visit from the renowned linguist Prof. Walt Wolfram. The purpose of his visit was to share aspects of The Language and Life Project of North Carolina State University’s Linguistics department. The Language and Life Project documents and showcases linguistic diversity across the United States. During the visit, Prof. Wolfram gave a talk and screened a documentary. "The collision of academic prejudice and accent is particularly ironic. academics tend to the centre-left nearly everywhere, and talk endlessly about class and Multiculturalism. (...) And yet accent and dialect are still barely on many people's minds as deserving of respect." (The Economist, January 30, 2015). Nothwithstanding the current emphasis on embracing diversity on most university campuses, linguistic subordination is still reproduced and enabled at most universities. Furthermore, language diversity remains excluded from or erased in the diversity canon. We conclude, based on the empirical study of linguistic aggressions and micro-agressions by students and faculty on a major university campus, that language differences remain a major source of social inequality and intolerance in higher education. in response to these findings, we have established an innovative language diversity program for universities that targets faculty, staff, and students. Illustrations of the process and the program are presented, and audiovisual productions, products and campus resources are integrated into the presentation. Documentary: "Talking Black in America"
Featuring footage and interviews with people across the country, Talking Black in America presents an informed portrait of language issues specific to African American heritage and culture. A screening of another documentary from NC State's Language and Life Project - "First Language: The Race to Save Cherokee." Watch it here.